Choose the right cards and win! This section will provide you with inside views about the "real" impact of choosing one or the other big impact card to support your team in winning matches.  All following findings are based on detailed statistical analysis of match results (to date my Basketball database consist of 450+ matches and stats - 88 to 92 rated Platinum team). Worst cards - Never use it! In this section I will tell you the worst cards to use in games and why this is so. Considering past matches against your teams I am sure you are suprised about the result below hence I realised how often especially the maybe worst card ever in BigWin Sport will be frequently used by most of the players out there. Hope this will help you to improve your results and any supporting feedback is highly welcome. Worst card ever is "Cashing in Dimes" - I know lots of people are still playing it but in fact it does not provide any benefit to your stats or the match result. Normally we would expect that Assists are improved and Turnovers going down but in reality the Assists are the same and Turnovers are going up! Gold card or not, "House Cleaning" does just provide a marginal increase of Defensive Rebounds won and therefore, considering the Gold Card Price which is approximately $2.50 each, a no, no, no go. Just good to sell it! The third place went to "Injury Free" a card which has a clear effect applied too, but the question was does it impact my average game results. After analysing the database it is clear that in average you get an injured player every 9th game, with a much higher rate for games against Bronze teams. The loss rate with injured players is similar to the one without. Therefore to waste a valuable card spot to avoid injuries is not recommended and the card has less value for the game result. This is the part you should read very diligently. It is based on time intensive data collection and analysis of BigWin Basketball match results. As you know the newest Hothead App offers you the biggest amount of match stats down to the player level. Perfect job, Hothead, this is a great feature! The figures presented in the table below show you quite exactly what the impact of each card is, of cause for an average match and seen on the longer term. All of you know that the game engine calculates with a large random factor, bonus for weaker teams and as already mentioned way to many upset results. Means you can play the best cards to find against a 35 rated opponent team without any impact cards played and still loose the match. Well, we all have to live with that, but this does not mean we should not understand how each card impact the game under “normal” circumstances. All results are based on my database, as already mentioned in the sections before and please note kindly that I took always care on eliminating cards which might impact the effects I’d want to review. FOCUSSED and RAINMAKER, placed together, do not obviously accumulate their card effects – Therefore it does not make sense to play both cards in the same match. RAINMAKER seems to have no real counter card! Please note the results in the last column to understand the effects of “Counter Cards” played by your opponent. 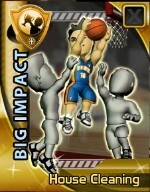 Sometimes common impact card eliminate or reduce a big impact card (Gold ones) bonus. Well, this is nice to know I guess, but assuming that each a card has a certain impact on the match it might not get you the right hype to win. Therefore get more inside view in the next part of the review called “Enthon’s card benefit rating”. Using all the information I collected in my database had mainly one intension: To find out what are the best impacts cards to use and what kind of combos will get the most match winners. 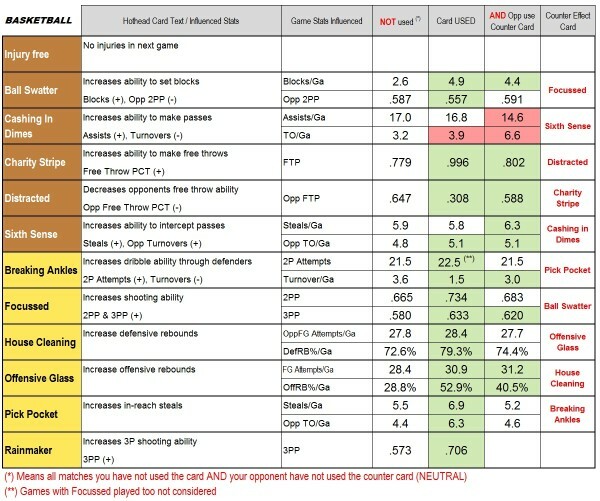 Before we take a look on my card value rating it should be mentioned that it is not easy and took me some time to find methods to analyse if a card had an impact on the match or not. Considering that Hothead's game calculation engine has a certain random factor in it anyway I assume that there are more influence criteria like your position on the actual ladder, your last few match results, upset loss factor and for instance how many daily trophies you have won in the past days and many more. About all these game engine control mechanismn I will write publish an article later on. Most big impact cards have indeed just a marginal influence on the match result! Of cause using the right cards and combos will increase your chance to win more matches but the main factor your team rating. However, there are some impact cards out there which are really good ones and some of them are not the expensive golden ones - Take a look! Please note that my database considered the interaction between cards played by both teams, team ratings or as well upset losses. By the way, the average result advantage for each team rating point you are better or worse as your opponent turned out to be 0.32 Points. Amazingly consistent by the way. 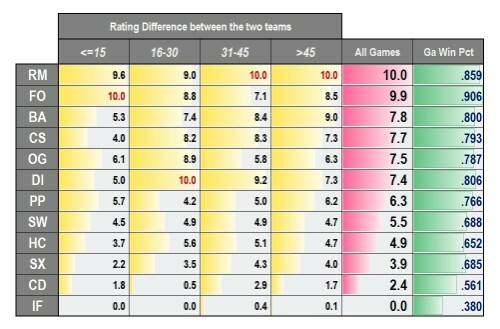 Means if your team rating is 10 points better you get an advantage of approximately 3 points per match. Best things last. To know good cards is one thing, what I learned quickly too is that the best single cards do not act all the time well together as a combo. Best example is that it does not help you much to combine Rainmaker and Focussed as the two best cards per my rating hence they do not accumulate their specific effects. Best Big Impact Card Combos to win? 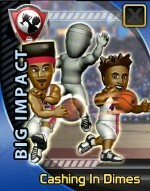 Before I share my ultimate results about the best big impact card combos to win matches in BigWin Sports Basketball, I like to explain how I identified it for you. As mentioned in the section before it is not all about putting the best single cards together, indeed you have to take into account the cards which are usually played by the majority of your usual opponents as well as the influence which counter cards may have too. Another very important factor is your team’s base skill rating. Means if you team has a rating of 50 you cannot expect to win all games against 80+ teams also if you choose the best card combo I found, considering that 30+ rating points can’t normally be equalized by even the strongest three gold cards played. It works sometimes thanks to Hothead’s game engine underdog bonus but in less then 20% of the matches. However if you are able to pay the price for the strongest combos your winning percentage will increase. Anyway, please keep always in mind the overall economics respectively your teams bankroll. If you spend on a regular basis real money to buy more bucks, no problem, just go for it. If you like to tweak the system a bit towards your favour, means in winning more bucks as you spend, you have to think twice. Is it really worth to throw in three gold impact cards, worth approximately 7.50 Bucks, in one single match? Don’t worry, my next project will start soon and will provide you with tips and tricks to survive financially, if Hothead is not adjusting the rules as they did for the contract cards. Let me present the best card combos for each wallet size of game money investment. Well the more expensive ones are indeed often slightly better but you can win a fair number of matches also using for instance my personal best bargain combo instead. 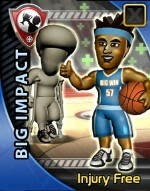 Best Bargain Combo in BigWin Basketball! Best Card Combo to play? Thanks to all the great comments of top players in the Forum, I like to add that it seems to be generally the best combo to win but replacing Breaking Ankles with Pick Pocket get's definetly better results in Amateur Trophies and if you play against similar rated team.